Every business owner has a few of those internal processes that you can’t exactly call seamless. Maybe your customer service experience is a little clunky. Are the leads not pouring in as they should? Are there gaps in your employee training and on-boarding method? 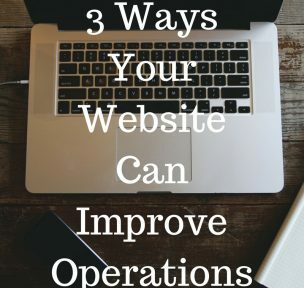 You can actually use your company website to streamline your business operations and handle several tasks from various departments within your business. For example, your website can perform customer service, human resources, marketing, sales functions, and more. Read on to find out how to help your website help you in some of these specific areas. Ensure your most frequently requested information, such as hours, address, or directions, is easy to find and highly visible. Create and post content that explains what you do. You should also provide information on topics related to your industry. This content can include tutorial and how-to videos that empower visitors to help themselves. Set up an email account for support to solve problems that way. Implement chat bots on your website. These are easy to use, and customers like being able to reach you easily. They also make your brand appear friendly and helpful. Create a support page and forum. Having an area where your customers can interact with one another and answer each other’s questions is a great way to build community and relieve your customer service team. Make sure your website is user friendly and easy to navigate. You will get fewer calls for help if your customers can easily find what they’re looking for on your website. You can use your website to learn more about your customers and leads. Do this by analyzing your website’s analytics through a software like Google Analytics. This lets you study your customers’ and visitors’ behavior when they visit your site. For example, you can find out how people land on your website — which keywords are they using? Did they plug in your name directly? Were they referred by another source? Did they find you through social media? You can also track where your visitors live, how much time they spend on your site, and at what point they leave your site. This information can give your marketing efforts laser-focus by pinpointing exactly what you need to work on. For example, if you need to increase your organic search traffic, boost up your SEO. Social? Post more and include your link. Email? Send people back to your website with pointed calls to action in your email messages. Additionally, knowing your audience demographics can help you better craft your messaging and brand voice. For example, the language you use for a 20-year-old female will be significantly different from how you speak to a 45-year-old man. Overall, your website should be a sales and lead generation machine. There are so many ways you can easily optimize your website to ensure the leads keep rolling in, see our post on How Many Leads are you NOT Capturing. Let your website do this work for you, and see your sales numbers rise. Not only does your website improve efficiency in your marketing, sales, and customer services departments, but there are applications for it in human resources and accounting, as well. For example, you can enable e-commerce capabilities on your site to automatically track sales and send them directly to your accounting department. And you can handle invoicing on your website, too. This decreases the need for printing and mailing and is highly convenient for your customer as well. Create a “careers” page where you can recruit and vet applicants. Add your mission to your website for new employees to familiarize themselves with it. Build a learning hub full of processes, policies, procedures, and training content only accessible to employees. Add an HR meeting scheduler for employees only. Your website is your 24/7 salesperson, marketer, HR manager, and customer service representative. It’s up to you to make the most of it. 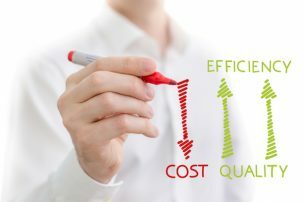 In summary, your website can reduce business costs and increase efficiency with relatively simple changes or additions. Free up your time and employees’ times by having automated processes and templates. Offload repetitive HR and customer service tasks. Lessen the need for multiple full-time customer service reps. Decrease printing and mailing costs by eliminating the need for paper invoices. Allow you to conduct your own marketing research. Decrease the need for web developers by using a Contact Management System (CMS). Learn more ways your website can help boost your business. Is your website performing at its peak capability? Is it bringing you leads, sales, and increased efficiency? If not, let TuiSpace help you. Our team is full of industry experts who bring you years of experience and diverse backgrounds at low costs. We can build a beautiful, interactive website with responsive design, boost your online presence with SEO, manage your web hosting, and everything in between. Give us a call today to tell us about your vision for your website. Click here for a quote. We can’t wait to help your business grow.